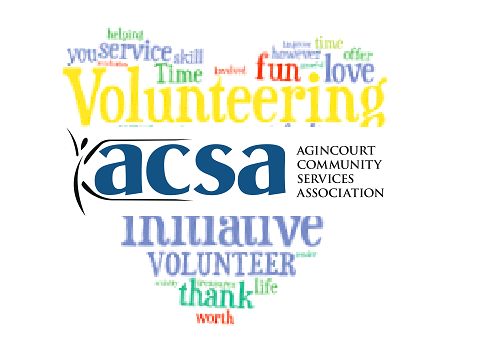 Thank you for your interest in volunteering at Agincourt Community Services Association (ACSA)! Much of the work we do at ACSA would be impossible without the help of our dedicated volunteers. In 2018, our volunteers contributed over 19,000 hours to our different programs and services! We believe that volunteers are invaluable to our organization. They provide us with new ideas, energy, enthusiasm, skills, and talents, and we appreciate and welcome the different experiences, perspectives, and knowledge our volunteers bring with them when they volunteer. We ask everyone interested in volunteering to complete and submit a volunteer application form. Our volunteer application form is designed to help us match your skills, interests, and availability to the volunteer needs of the agency. Our volunteer needs are always shifting so not all of the areas listed on the form have volunteer opportunities at the moment. We only accept volunteers 13 years of age or older. The majority of our programs run Monday to Friday during business hours. Thus, unfortunately, we do not have any volunteering opportunities on evenings or weekends at this time. The majority of our programs also ask for a consistent commitment from volunteers and, as such, volunteers are assigned a shift that they are expected to attend weekly. You can download our application form here, and either e-mail it to the Volunteer Coordinator at blaura@agincourtcommunityservices.com, fax it to 416-321-6922, or submit it in person at any of our locations. You can pick up, fill out, and submit an application form at any of our locations. We run a formal volunteer program. The application form is the first part of the volunteer process. The second step is a volunteer interview, and pending the interview, volunteers will be asked to attend a volunteer orientation session before they begin volunteering. All applicants will be contacted within 10 business days by e-mail or phone. Thank you, again, for your interest in volunteering with us! If you're interested in volunteer opportunities for groups, please contact the Volunteer Coordinator directly at blaura@agincourtcommunityservices.com or 416-321-6912 ext. 248. Please note that we are not accepting any summer students. If you have additional questions regarding volunteering, please contact our Volunteer Coordinator at blaura@agincourtcommunityservices.com or 416-321-6912 ext. 248.